I passed the NPTE! I officially have a New York state PT license number. I really hoped this series would end on a positive note, and it did! Over the past few weeks a number of current physical therapy students have asked about the difficulty of the exam. The NPTE is not easy and it shouldn’t be taken lightly. My only thought when leaving the testing center was that I had failed. I began planning out, in my head, how and when to re-schedule for another test. You may feel the same way, but stay calm. They've also asked what was critical to my success. I can't emphasize enough… time. You must dedicate adequate time every day to study. On average, I spent 6 hours studying for at least five days a week. This took place over a 5-week period. The next challenge I encountered was determining where to start. Not only did I need to decide where to start, but to what depth would I need to understand the material that I covered. These questions were answered by one resource that contributed to me passing, PT Final Exam. Mastermind Group - PT Final Exam scheduled 20+ live discussions over the course of 6 weeks. The sessions were usually 60 minutes, but sometimes ran longer if there were many questions. During the webinars, one of three presenters discussed different topics that were essential to success. There’s also a “Chat Specialist” that assisted the presenter in fielding the questions. I attended 2 live sessions and watched the rest at my convenience; they are recorded and archived. The presenters did a great job of reviewing key topics and did their best to answer everyone’s questions. Will, Reema, and Jonathan all take turns leading the discussions. They are genuine and have great personalities. Each has their own way of creating a strong community and they want to see everyone succeed. They're available by phone and e-mail if you have any specific questions that aren't covered during the live discussions. During each discussion you'll begin to recognize the peoples' names in the chat room. Knowing that every person is there for the same reason and is going through the same struggle created a strong community. I learned helpful strategies and tips from others that were enrolled. As I mentioned earlier, the presenters do a great job of making everyone feel comfortable, "Wahooo" for Jonathan. A study outline and assignments are provided to keep you on track. You won't miss a topic with this plan of attack. I joined the Mastermind Group in the middle of the program and wasn't able to take advantage of this, but looking back it would have saved me the headache of jumping from topic to topic and chapter to chapter in the TherapyEd guide. The assignments are long. They are detailed. They are designed to be your own personal study guide and completing them will help you learn the topics before they are discussed live in the group. Reema and Jonathan (presenters) both enrolled with PT Final Exam after failing the NPTE. 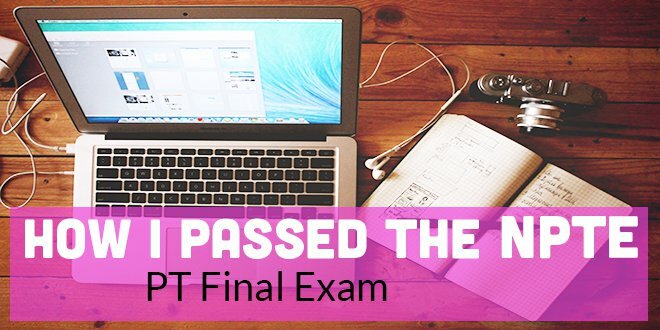 As a result of their persistence, dedication, and some help from PT Final exam they successfully passed the NPTE. They truly understand the day to day struggles of studying and know what it takes to pass. They provided priceless insight on how to study for the exam with each discussion they led. Because they have taken the NPTE, within the past 5 years, means that their insight is still relevant. You can't have too many practice exams. These played a huge role in my study process. More time was spent reviewing the exams than taking them. My review sessions would usually be an all day event, ~6 hours. In the time that I studied, I took 6 practice exams. PT Finals Exam's 200 questions PT are the perfect addition to the PEAT and tests that come with TherapyEd or Scorebuilders. When choosing a study guide you'll undoubtedly read that the TherapyEd text has more detail than most. This is true, and it's a hard read. Make sure you drink a cup, or two, of coffee before you sit down. After exhausting my eyes reading I loved the convenience of being able to login to PT Final Exam, find the latest recorded discussion, and then sit back and watch/listen. This type of studying was passive, but I did pick up helpful tips! The webinars and study program end several weeks before the NPTE. I'm sure this is by design, but I found that this was when many questions came up. As the exam creeps closer you'll begin to question everything you know. A pro that I listed earlier was the community. Everyone wants to help each other. Everyone is encouraged to ask questions. Sometimes however, the questions asked were irrelevant and resulted in tangents that left people more confused. There were times when I found myself getting lost in the chat conversation as people offered up advice that was “suspect”. During these times I questioned myself, doubled checked, only to find what was said was incorrect. A word of caution, do your due diligence. The presenters and chat specialist can't catch everything, and if another person enrolled offers up an answer be sure to double check. As a student I understand that funds can be limited. PT Final exam isn't cheap, but nothing of value ever is. If you're not great at planning, strategizing, or studying in bulk, this is for you! If you've failed the NPTE and want to set yourself up for success the next time around, this is for you! It's an investment in yourself. Don't look back and think "what if?"